A commission for a lovely English couple John and Celia, now spending a lot of time in N.Z. in their magnificent new home. 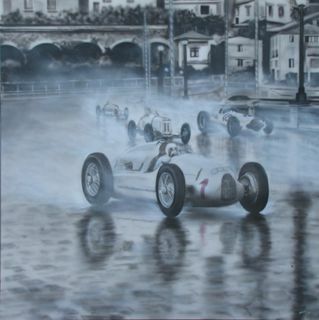 Painted in acrylic lacquer on three canvas's 1450mm sq, all black white silver and grey, red numbers on the silver cars. The brief required each canvas to be its own work but all three to come together as one. 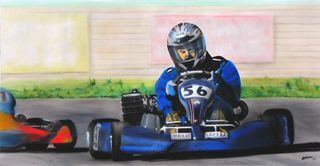 Gary and Maxine are old friends of mine and I was delighted to be asked to do a portrait of Gary involved in his latest passion - Karting, - to celebrate his 50th Birthday. And yes it IS meant to read "PAY it safe". A Commission work for my pal Harri to hang on the wall opposite his portrait of Tazio Nuvolari I had painted earlier for his apartment at Hampton Downs Motor Race Circuit. It is 3.6 metres long x 1 metre high, painted in Auto paint silvers and blacks on Signboard. It really caught my eye so I did a live airbrush auto portrait of the cowl and front part of the woodwork at the public Show and Shine. The vehicle owner, Woody, wanted to buy it before it was finished, but unfortunately it was being raffled so he bought 15 tickets, but he didnt win it! This commissioned work of this awesome racecar was a pleasure to do even though it required a lot of detail and accuracy, and therefore time, about 24 hours in fact. I worked from a photo I took of the machine sitting in the pits at the 2009 Nostalgia Drags so I had to "fire up the motor and have it do a burnout"
One of the beauties of airbrushing is you can virtually make any image do anything!! 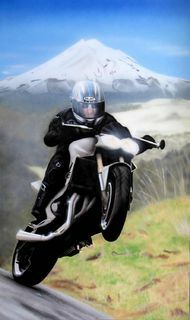 Started this as a live airbrushing at the Nostalgia drags 2009 at Fram Dragway, Meremere . Both Guys signed even though I had not finished the work and I thank them sincerely for that! Put it up for auction and Craig from Tauranga was the lucky bidder. It is now framed and lives on his lounge wall.